Are Hardee's And Carl's Jr. the Same Thing? Yes. But Not for Long. When you think about the obviously tethered, oft-confusing relationship between Carl's Jr. and Hardee's, think about the Brady Bunch. It's the story of a lovely burger chain, that had been selling burgers on the West Coast since the 1940s, who met a slightly younger Southern-based burger chain, who was busy expanding into the Midwest and Mid-Atlantic. The rest, is fast food history. Oh, and by "met," I mean "acquired by a larger parent company and combined into one, unified yet segmented brand," obviously. In the 1940s, Carl Karcher and his wife, Margaret, opened up a hot dog cart in downtown Los Angeles, that would expand to two full-time restaurants in the '50s, more than 100 in the '70s, to nearly 1500 worldwide locations today. It's the classic deep fried American dream: the started focusing on burgers, rode the fast food wave paved by the Golden Arches, and became a West Coast institution. In 1997, CKE (the parent company developed and driven by Carl's Jr. success) acquired Hardee's, a burger joint leaning heavy into Americana-classics. Wilbur Hardee founded his eponymous franchise in Greenville, North Carolina in 1960. Like Carl Karcher before him, he was able to parlay his initial restaurant into rapid expansion over the next several decades, expanding Hardee's reach deep into the Midwest. At one point in the early 90s, Hardee's even acquired Roy Rogers (the chain, not the dead singer), in hopes to claw their way into a fast food fried chicken market cornered by Colonel Sanders. They didn't, and sold it a few years later. Nevertheless, it was clear both brands were looking to become bigger than themselves. To cover more ground. To find a way to put their names -- and burgers -- into the minds and stomachs of more Americans. Joining forces just made too much sense. "It was like two kids that suddenly moved into the same house together," said Jeff Jenkins, Chief Marketing Officer of C.K.E., "and it all went really well, it was the ideal way to make both brands bigger." And like any happy marriage, they let each other breathe: rather than totally rebrand every Hardee's into Carl's Jr -- or visa versa -- they decided to let each brand continue to exist… at least by name. "Both brands has been around for a long time, both had dedicated fans and really distinct personalities," Jenkins said. "It really made sense to keep them separated, keep them intact. Entire generations had grown up with Hardee's, and we didn't want to lose that." Even though both brands managed to keep their names, they began coalescing into one entity. So much so, sometimes it's hard to tell the difference. 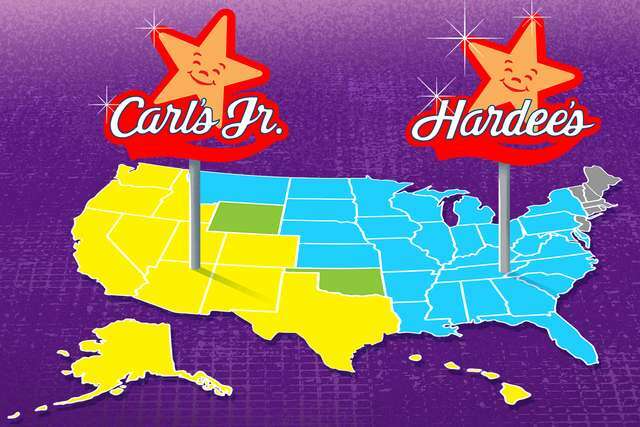 What's the (current) difference between Carl's Jr. and Hardee's? Carl's Jr still exists primarily on the West Coast and the Southwest, with a handful of locations in the Northeast. Hardee's operates, well, basically everywhere else -- including the Midwest and South. But from the outside -- with a basic red and yellow color scheme and an anthropomorphic star mascot named… Happy Star -- both brands appear exactly the same, apart from the name. Ostensibly, it would appear that CKE combined the two companies, but only kept the name in an effort to retain fans. But once you peel apart the layers of the menu -- and the culture of each brand -- you start to see the subtleties that actually make a difference. "I think fans of both brands will be quick to tell you, Carl's Jr and Hardee's are very different," Jenkins said. "And most people definitely prefer one, over the other. People have strong opinions here... surprisingly strong." Since the merger, Carl's Jr has been marketed and developed as a more "in your face," type of brand. They seemingly aimed their advertising and menu expansion at younger people (who may or may not be visiting a Carl's Jr. for late night munchies/drunchies). At Carl's Jr, you'll find jalapeno poppers and fried zucchini. You can order a super spicy, "El Diablo" burger. In the AM, there's an extensive menu of breakfast burritos. Carl's Jr. isn't afraid to get a little weird. As far as fast food is concerned. Hardee's -- on the other hand -- has always been the more "traditional" sibling. They have kept southern accents throughout their menu, like hand-breaded chicken and biscuits made in-house. Their advertising tends to be softer, cleaner, and aimed more at embracing Americana. It's slight, but noticeable. And the differentiation makes sense. If you remember anything about the burger twins' branding, you probably remember the half-decade when they made -- sometimes not-so-positive -- splashes in the advertising world by pairing their food with scantily clad models like Kate Upton and Paris Hilton (NSFW, depending on where you work). Obviously, there was backlash. Eventually, they backed away from the misogynistic-leaning ads. But anyone with a bare sense of marketing basics should realize, this type of advertising might not appeal to all types of consumers, and specifically turn some people off. This is important, as Carl's Jr and Hardee's have very different clientele. Jenkins and his team have done extensive research into the kinds of people who frequent the individual brands. Carl's Jr. fans love the MLS. They listen to EDM. Hardee's fans are obsessed with college sports and country music. It's no surprise, given the regional separation between the brands, and it's enough to make a huge difference in how the brands are valued by their loyal customers. "For a while, we combined both together from a marketing standpoint. And it worked. But right now we are at the point where we decided we need to separate the two in a way we've never really done before, in order to make each brand stronger." Simply put: the two brands that joined forces in the 90s in an effort to grow (which, they certainly did, as neither brand has ever had a bigger presence in the fast food landscape), are now deliberately drifting apart, in an effort to continue growing. And now, in 2018, the two kids who moved in together in the late 90s are finally getting out of the house, ready to become themselves again. The brands may be more alike than they are different, but, because their fans are so different, the cleaving of the chains seems to make more sense than ever. Is it just a marketing ploy? Probably. But marketing is the main component of any brand identity. Does it really matter what you are, if people don't know about it? This is incredibly evident in the recently unveiled (and very different) marketing campaigns for each side. Carl's Jr is embracing the borderline goofy mystique of being a destination for diners looking to shed dietary inhibitions, and delve into the guilty pleasures of fast food. Their "Call of Carl's" campaign -- with assistance from the Texan drawl of one Matthew Mcconaughey -- is basically centered around insatiable cravings for ridiculously caloric foods. It's light-hearted fun… even if it's shilling heart-stopping food. Hardee's is doubling down on tradition with their "Tastes Like America” campaign. It's key words are "pride," "real people/food," and "down home approach." It's obviously appealing to America's heartland, with a little help from trap/country star Big Wet. "This move will benefit both brands, but probably Hardee's a little bit more," Jenkins said. "Carl's Jr has a 'bigger' personality, and I think Hardee's identity probably got hidden a little bit over recent years, and lost itself in Carl's Jr, a little bit." And so far, it seems to be paying off. According to Jenkins the "brand love" (basically, a marketing metric that measures fan interaction, and overall approval) has jumped 10% for Carl's Jr since the "split," and more than 20% for Hardee's. "And those are truly amazing numbers. After a successful campaign, you are lucky if you see a 5% spike," Jenkins said. So, they have no plans on reuniting the brands any time soon -- at least not on a marketing front. And marketing, is basically what this whole thing boils down to. Back in the '90s, they combined menus, but kept their names separate, because they believed that was the clearest path to growth. Right now, Hardee's and Carl's Jr remain more alike than they are different, even if they are becoming more different than they have been since the Clinton administration. And they are going back to their individual roots, in an effort to keep that growth consistent. Like the Brady Bunch before them, they really made this marriage work. Even if they need some "space," once in a while.